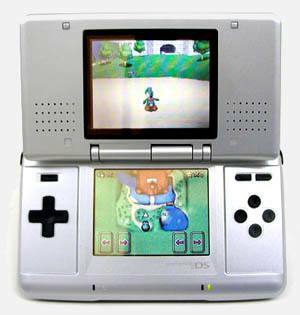 Before we start with the gaming capabilities of the unit, it should be mentioned that the console itself comes with some inbuilt software called PictoChat that allows you to wirelessly talk to other Nintendo DS gamers, provided that they are in range. 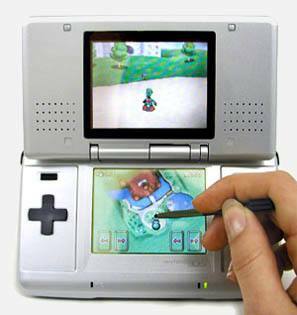 PictoChat gives the gamer a choice of 4 rooms to join (A - D) that allows the user to perform a variety of functions from sending text messages to drawing their own pictures. Another impressive feature is that the unit also has the ability to download software from another DS unit which means that some two player games only require one cartridge to play between two or more people. The first time you turn your DS on, the console asks the gamer to input a variety of details that includes your name, the current time and date, your favourite colour (which becomes your background colour) and your birthday, although unfortunately I have to wait till November 22nd to find out what happens. Once this information has been inputted, the user is greeted to an extremely user-friendly interface that allows the gamer to either (provided there is a cartridge installed) play a Nintendo DS game, run PictoChat, DS Download play (for multiplayer games) or launch a GBA game. 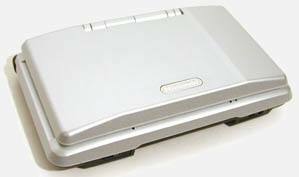 As mentioned before, the Nintendo DS is backward compatible which means you can play GameBoy Advance games on the unit. I tested a variety of GBA games on the console that include Golden Sun and Grand Theft Auto Advance and I must say the graphics looked crisper & sharper and they both ran considerably smoother than on the consoles they were intended to be run on. Another interesting feature is that you can also have two cartridges installed into the unit at once, a Nintendo DS game and a GameBoy Advance game which is ideal for those long trips. Nintendo fortunately sent a variety of games to review with the console that included Mario 64 DS, WarioWare Touched! and Project Rub to name a few of the titles. As with all DS titles, both screens are always used during gaming and the bottom touch screen performs a variety of different actions that include controlling your character (Mario 64 DS) or trying to get fish out of a man's stomach (Project Rub). The introduction of the touch screen truly makes gaming more interactive now because you are not limited to the use of buttons. 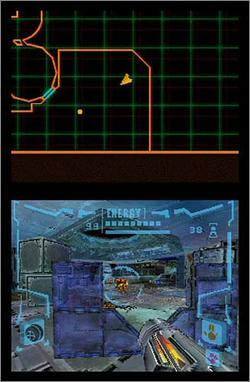 In Metroid Prime: First Hunters (Demo), gamers get to experience the ferocious first-person action of the Metroid Prime universe on the Nintendo DS in this playable demo which truly showcases the Nintendo DS console. The demo contains a variety of single-player training modes that include Regulator, Survival and Morph Ball and also allows you to compete in Death Match arenas with your friends over a wireless connection. 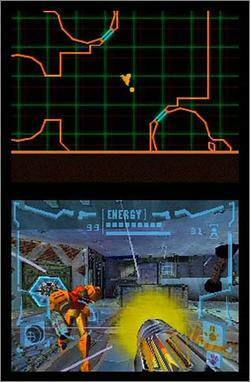 The multiple control schemes take full advantage of the touch screen, giving all gamers an ideal way to play and really takes first person shooters to another level. The accuracy of the stylus is actually better than using a mouse on a PC because you just point and click to shoot. 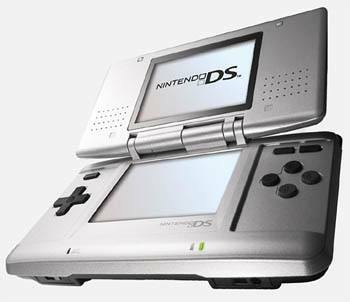 During our tests, the battery life of the Nintendo DS was around 8 to 9 hours (10 hours is quoted by Nintendo) but it also depends on what applications you are running. The high battery life of the unit is achieved by the lithium-ion battery that takes 4 hours to charge the battery which is a small price to pay for portable gaming. Another nifty idea is that when the unit is closed while you are playing a game, the system goes into a sleep mode to maximise battery life. In conclusion, the Nintendo DS is a brilliant gaming console that truly takes portable gaming to the next evolutionary stage. The only downside to the unit is that sometimes it does become a little heavy through continuous gaming sessions but it's a small price to pay for what this unit can perform. Although the majority of first generation games are aimed at the younger gaming market, there are enough adult titles on the horizon to allow the more mature gamer to truly enjoy this new console and with the PSP just around the corner, I'm sure the Nintendo DS will give it a run for its money with its dual screens, better battery life and use of a touch screen. And for $199.95 with a bonus demo game of Metroid Prime: First hunter, you can't go wrong, well done Nintendo!